I’m not one to use a whole bunch of different recipes and some nice people have asked for some from the food photos I’ve posted. I will describe how I made the meals. Last night was pretty simple. 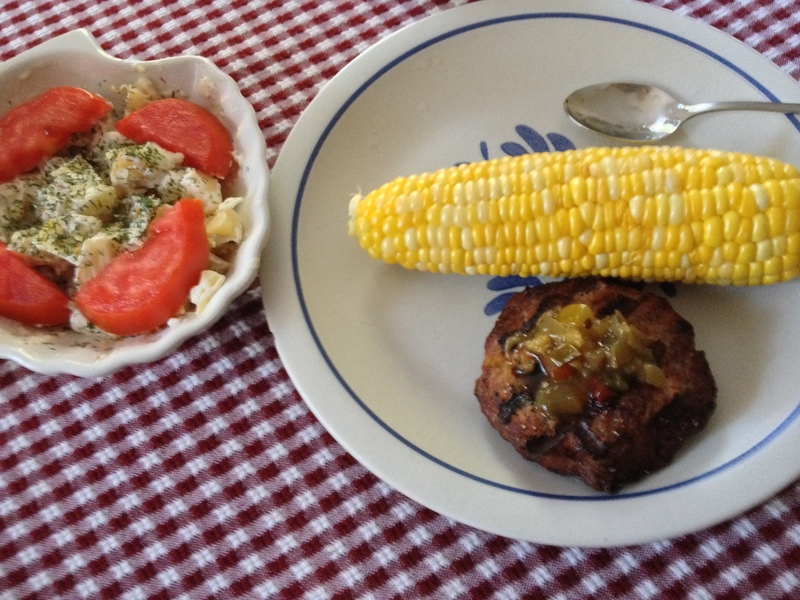 I grilled a burger on the gas grill and topped it with a spoonful of chow chow relish from the farmer’s market. There is a blog entry about chow chow in my blog archives. Boiled an ear of corn, showed it to butter but didn’t’ put any on, but did put some Himalayan sea salt on it (beautiful pink salt). The little potato salad was nothing more than dicing up leftover potatoes from the other night and adding some diced celery and onion, salt, pepper and 1 T of mayo. I dusted the top with dill mix and plunked some wedges of fresh tomato around the perimeter. Voila. It tasted as good as it looked. The other night’s meal was also pretty simple. I grilled a small piece of sirloin. While the grill was warming up and the steak cooking, I boiled some small fresh potatoes. 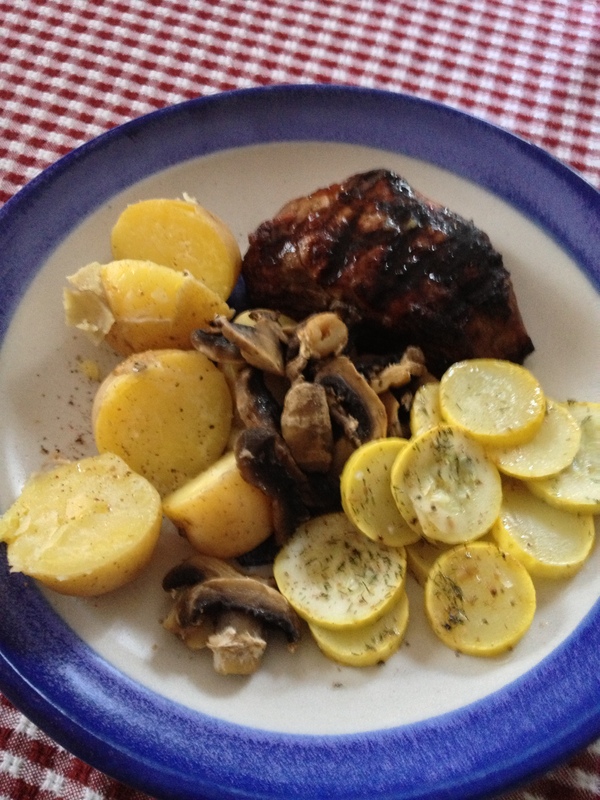 In foil packages on the grill were sliced mushrooms and yellow squash (separate packets). Each packet had some olive oil and seasonings. Delicious meal and just one small saucepan to clean. This entry was posted in cooking, easy meals, Food, grilling, journey, simplicity. Bookmark the permalink. Man, your food looks good!